Oscar Wilde's play The Importance of Being Earnest offers a wonderful insight into how Victoria started out as two distinct stations. When Jack tells the horrified Lady Bracknell that he was found as a baby in a handbag at Victoria Station, he tries to reassure her that it was in the cloakroom of the more respectable Brighton line. Knocking down the dividing wall in 1924 brought the shabby Chatham terminal under the same roof as the Brighton station, but the track layout meant that in practical terms the east-west divide stayed in place. It could even be said that the classier side of the station has switched to Chatham as platform 2 is where passengers board Pullman carriages for a journey to the continent on the Venice Simplon-Orient-Express.Victoria Station has regular departures to destinations in the South, including Gatwick Airport via the Gatwick Express and the South Coast. Trains to Brighton leave three or four times an hour and take 50-75 minutes. 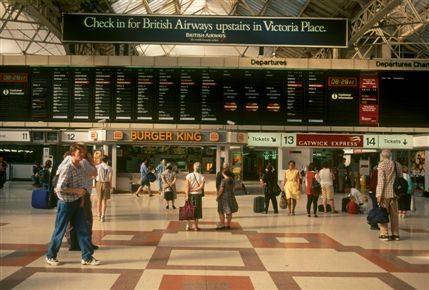 Victoria Tube Station is directly below the main station.